Great timing. You are very talented. 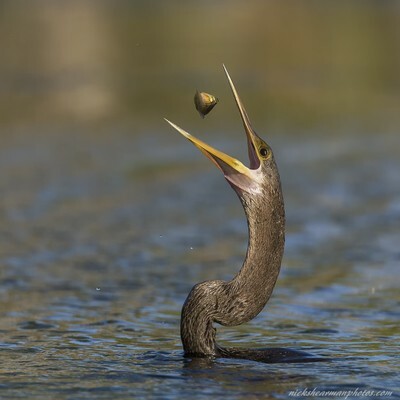 Anhinga flips its prey ,a fish , after it spears it ,off the end of its bill and catches it in the air . Everglades national Park ,Florida . In the Everglades National park ,there is a small pond at the edge of the road called Mrazek pond ,its full of wildlife activity for someone who has the time to sit and wait and watch .There are various types Herons and Egrets and of course Alligators to be found around the pond .There are also a fair number of Anhinga's that can be seen drying their wings on their favorite perches in the sun around the perimeter of the pond. The shot was taken at 17.19 on a beautiful sunny day. A Canon 7D ,Canon 500mm f4 telephoto lens and I had on a Canon 1.4 converter to give me some range to catch these small narrow heads coming out of the water. A Gitzo carbon fibre tripod and a Wimberley MkII panning head were used to support the camera and lens .a very low stool was placed near the edge of the water to sit on and to give me the very low angle to the water for the shot that I was looking for. I watched the Anhinga's come to the surface after a swim underwater to spear their prey ,and I had seen the flipping of the prey into the air and the catching of the prey and then of course down the hatch the prey would go .I wanted to catch that moment when the prey was in the air at the point of the flip. Processing was fairly simple for this shot ,the usual tone ,exposure and sharpening adjustments and of course some cropping was applied . Camera Canon 7D ,Canon 500mm f4 ,Canon 1.4 converter , camouflage netting to help conceal the camera and tripod , bug repellent ,an absolute must if you wish to remain still , and a ghille bug suit for concealment and to resist the mosquitoes. Patience and determination . There were several things to take in while attempting to get this particular shot ,the observation of the behavior of the Anhinga's ,the location and access to the edge of the water to get the low angle ,the sunlight was afternoons only ,the camouflage had to hid me from prowling Alligators (being so close to the waters edge) and of course to allow the subject to be more comfortable and do its thing. Higher shutter speeds and ISO were require to freeze the moment . The hardest part was trying to first locate the thin head and neck in the viewfinder after the bird surfaced and then try and get the focusing to stay with the subject . The closer opportunities worked the best ,that's were the camouflage came in, the last thing I can say is that I was bound and determined to get this shot and after five to six afternoons going at it , it finally paid off.